Ukraine marks Constitution Day on 28 June. 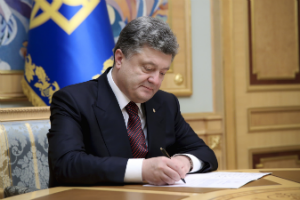 Ukrainian President Petro Poroshenko has signed the law on amendments to the constitution regarding the judiciary. The law will be published tomorrow, 29 June, according to an UNIAN correspondent reporting from the parliament chamber where a solemn meeting on the occasion of Constitution Day was held, attended by the Ukrainian president. "Dear MPs, we have just shown an example of responsible work on improving the basic law. Amendments to the constitution in part of the judiciary have been adopted in full conformity with this constitution," Poroshenko said. "The law on the amendments to the constitution in part of judiciary will be published tomorrow," he said. "I have signed it," the president said. As UNIAN reported earlier, parliament on 2 June adopted the Law "On Amendments to the Constitution of Ukraine (regarding judiciary)". The document is aimed at ensuring the independence of the judiciary, toughening of the requirements to and professional standards of the judges, limitation of immunity of judges to a functional level, optimization of the judicial system, and ensuring continuous and effective operation of the judiciary for a transitional period.